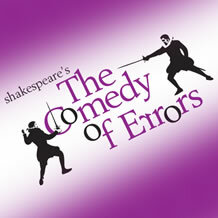 Stages on the Sound brings their much heralded production of William Shakespeare’s The Comedy of Errors to the Playhouse. In this hysterical contemporary adaptation, the bard’s tale is performed with 4 actors. This production is Shakespeare in its most accessible form. BRAD DEPLANCHE (Dromios, Egeon, Abbess, Dr. Pinch) is thrilled to be making his Playhouse on Park debut. Recent shows include; THE 39 STEPS, for Florida Repertory Theatre and Orlando Shakespeare Theater, Porthos in THE THREE MUSKETEERS for People's Light and Theatre Company in PA. and Pseudolus in A FUNNY THING HAPPENED ON THE WAY TO THE FORUMfor Pennsylvania Shakespeare Festival. Off-Off Broadway; China; THE WHOLE ENCHILADA (NY Fringe Festival), CLOUD 9 at Classic Stage Company and ARMCHAIR IN HELL at Theatre at St. Clements. Regional Theatre; Actors Theatre of Louisville (5 Seasons), American Conservatory Theater, South Coast Repertory, Syracuse Stage, Utah Shakespearean Festival, Cape Playhouse, Hangar Theatre, B Street Theatre, and Seattle Shakespeare Company. Upcoming; THE 39 STEPS for Actors Playhouse in Miami and THE COMEDY OF ERRORS for Shakespeare Santa Cruz. Brad won several regional theatre awards for his portrayal of Passepartout in AROUND THE WORLD IN EIGHTY DAYS, directed by Russ Treyz. Brad hails from Michigan and holds an MFA from the American Conservatory Theatre. Go Blue! JESSE GRAHAM (Adriana, Angelo, etc.) Playhouse on Park debut. NY theatre: THE ROVER(New York Classical), HEY GOD? (Times Square Equity Showcase). Tours: A CHRISTMAS CAROL (Troupe America), SMOKE ON THE MOUNTAIN (Cumberland Co. Playhouse). Regional: A FUNNY THING...FORUM (Monomoy Theatre), STEEL MAGNOLIAS (Derby Dinner Playhouse). Film: Trailerpark, Death of the Cool (MDIA 419). MFA: Ohio University. Great thanks to all my mentors and advocates, with a warm spot in my heart for Dr. Morosco. BRENDAN NORTON (Antipholus of Syracuse/Antipholus of Ephesus) is thrilled to return to Playhouse on Park, after playing Sir Mullet in TRAPEZIUM last season. Plays and Players: Gordon Schwinn (A NEW BRAIN); Society Hill Playhouse: Louis Ironson (ANGELS IN AMERICA); Villanova Theatre: Foigard (THE BEAUX' STRATAGEM). B.A. in Theatre Performance, FordhamU@LincolnCenter. Thanks to Will, the cast and crew, my family, and the Sobels.